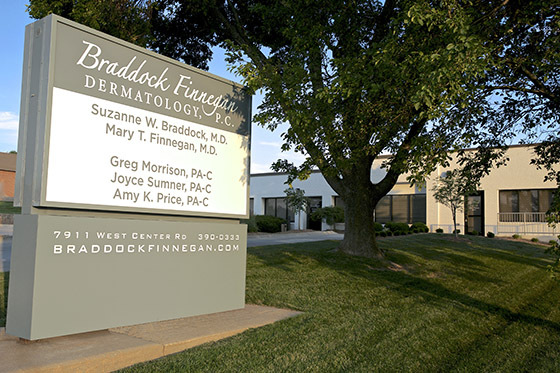 Founded in 1990 by Dr. Suzanne Braddock and under the leadership of Dr. Mary Finnegan since 2005, we strive to provide the very highest standard of care. We welcome the addition of Dr. Blake Helget to our practice this summer. We provide advanced medical and surgical care to patients of all ages. We also provide a full range of cosmetic services, with an emphasis on a “natural looking” aesthetic. We offer the newest, most innovative procedures available in the region. Office hours by appointment Monday-Friday by calling (402) 390-0333. Everyone at our office is at your service. Our office provides on-call service for emergencies, 24 hours-a-day, 7 days-a-week for existing patients. If you are unable to keep an appointment, we ask that you kindly provide us with at least 24 hours notice. This courtesy will make it possible for us to give your appointment to another patient. Most insurance plans accepted. Please contact your insurance carrier to verify that we are in your plan’s network of providers.